Oxygen is of fundamental importance for most living organisms. In higher animals such as human beings appropriate delivery of oxygen (by the lungs, heart, blood, circulation and blood vessels) to all the cells is a considerable challenge - particularly as inadequate delivery will impair metabolism whereas excess oxygen is toxic. Not surprisingly, inappropriate oxygen delivery to cells plays a major role in many human diseases. Hypoxia-inducible factor (HIF) is the major transcriptional regulator of cellular responses to hypoxia. The two principal HIF-α isoforms, HIF-1α and HIF-2α, are progressively stabilized in response to hypoxia and form heterodimers with HIF-1β to activate a broad range of transcriptional responses. Here, we report on the pan-genomic distribution of isoform-specific HIF binding in response to hypoxia of varying severity and duration, and in response to genetic ablation of each HIF-α isoform. Our findings reveal that, despite an identical consensus recognition sequence in DNA, each HIF heterodimer loads progressively at a distinct repertoire of cell-type-specific sites across the genome, with little evidence of redistribution under any of the conditions examined. Marked biases towards promoter-proximal binding of HIF-1 and promoter-distant binding of HIF-2 were observed under all conditions and were consistent in multiple cell type. The findings imply that each HIF isoform has an inherent property that determines its binding distribution across the genome, which might be exploited to therapeutically target the specific transcriptional output of each isoform independently. Cells adapt to environmental changes, including fluctuations in oxygen levels, through the induction of specific gene expression programs. To identify genes regulated by hypoxia at the transcriptional level, we pulse-labeled HUVEC cells with 4-thiouridine and sequenced nascent transcripts. Then, we searched genome-wide binding profiles from the ENCODE project for factors that correlated with changes in transcription and identified binding of several components of the Sin3A co-repressor complex, including SIN3A, SAP30 and HDAC1/2, proximal to genes repressed by hypoxia. SIN3A interference revealed that it participates in the downregulation of 75% of the hypoxia-repressed genes in endothelial cells. Unexpectedly, it also blunted the induction of 47% of the upregulated genes, suggesting a role for this corepressor in gene induction. In agreement, ChIP-seq experiments showed that SIN3A preferentially localizes to the promoter region of actively transcribed genes and that SIN3A signal was enriched in hypoxia-repressed genes, prior exposure to the stimulus. Importantly, SINA3 occupancy was not altered by hypoxia in spite of changes in H3K27ac signal. In summary, our results reveal a prominent role for SIN3A in the transcriptional response to hypoxia and suggest a model where modulation of the associated histone deacetylase activity, rather than its recruitment, determines the transcriptional output. Un-physiological activation of hypoxia inducible factor (HIF) is an early event in most renal cell cancers (RCC) following inactivation of the von Hippel-Lindau tumor suppressor. Despite intense study, how this impinges on cancer development is incompletely understood. To test for the impact of genetic signals on this pathway, we aligned human RCC-susceptibility polymorphisms with genome-wide assays of HIF-binding and observed highly significant overlap. Allele-specific assays of HIF binding, chromatin conformation and gene expression together with eQTL analyses in human tumors were applied to mechanistic analysis of one such overlapping site at chromosome 12p12.1. This defined a novel stage-specific mechanism in which the risk polymorphism, rs12814794, directly creates a new HIF-binding site that mediates HIF-1α isoform specific upregulation of its target BHLHE41. The alignment of multiple sites in the HIF cis-acting apparatus with RCC-susceptibility polymorphisms strongly supports a causal model in which minor variation in this pathway exerts significant effects on RCC development. Mitochondrial DNA disease is one of the most common groups of inherited neuromuscular disorders and frequently associated with marked phenotypic and genotypic heterogeneity. We describe an adult patient who initially presented with childhood-onset ataxia without a family history and an unremarkable diagnostic muscle biopsy. Subsequent multi-system manifestations included basal ganglia calcification, proteinuria, cataract and retinitis pigmentosa, prompting a repeat muscle biopsy that showed features consistent with mitochondrial myopathy 13 years later. She had a stroke with restricted diffusion change in the basal ganglia and internal capsule at age 44 years. Molecular genetic testing identified a previously-reported pathogenic, heteroplasmic mutation in the mitochondrial-encoded transfer RNA tryptophan (MT-TW) gene which based on family studies was likely to have arisen de novo in our patient. Interestingly, we documented an increase in the mutant mtDNA heteroplasmy level in her second biopsy (72% compared to 56%), reflecting the progression of clinical disease. The hypoxia-inducible factor (HIF) system orchestrates cellular responses to hypoxia in animals. HIF is an α/β-heterodimeric transcription factor that regulates the expression of hundreds of genes in a tissue context-dependent manner. The major hypoxia-sensing component of the HIF system involves oxygen-dependent catalysis by the HIF hydroxylases; in humans there are three HIF prolyl hydroxylases (PHD1-3) and an asparaginyl hydroxylase (factor-inhibiting HIF (FIH)). PHD catalysis regulates HIFα levels, and FIH catalysis regulates HIF activity. How differences in HIFα hydroxylation status relate to variations in the induction of specific HIF target gene transcription is unknown. We report studies using small molecule HIF hydroxylase inhibitors that investigate the extent to which HIF target gene expression is induced by PHD or FIH inhibition. The results reveal substantial differences in the role of prolyl and asparaginyl hydroxylation in regulating hypoxia-responsive genes in cells. PHD inhibitors with different structural scaffolds behave similarly. Under the tested conditions, a broad-spectrum 2-oxoglutarate dioxygenase inhibitor is a better mimic of the overall transcriptional response to hypoxia than the selective PHD inhibitors, consistent with an important role for FIH in the hypoxic transcriptional response. Indeed, combined application of selective PHD and FIH inhibitors resulted in the transcriptional induction of a subset of genes not fully responsive to PHD inhibition alone. Thus, for the therapeutic regulation of HIF target genes, it is important to consider both PHD and FIH activity, and in the case of some sets of target genes, simultaneous inhibition of the PHDs and FIH catalysis may be preferable. Hypoxia-inducible factor (HIF) directs an extensive transcriptional cascade that transduces numerous adaptive responses to hypoxia. Pan-genomic analyses, using chromatin immunoprecipitation and transcript profiling, have revealed large numbers of HIF-binding sites that are generally associated with hypoxia-inducible transcripts, even over long chromosomal distances. However, these studies do not define the specific targets of HIF-binding sites and do not reveal how induction of HIF affects chromatin conformation over distantly connected functional elements. To address these questions, we deployed a recently developed chromosome conformation assay that enables simultaneous high-resolution analyses from multiple viewpoints. These assays defined specific long-range interactions between intergenic HIF-binding regions and one or more promoters of hypoxia-inducible genes, revealing the existence of multiple enhancer-promoter, promoter-enhancer, and enhancer-enhancer interactions. However, neither short-term activation of HIF by hypoxia, nor long-term stabilization of HIF in von Hippel-Lindau (VHL)-defective cells greatly alters these interactions, indicating that at least under these conditions, HIF can operate on preexisting patterns of chromatin-chromatin interactions that define potential transcriptional targets and permit rapid gene activation by hypoxic stress. Activation of hypoxia pathways is both associated with and contributes to an aggressive phenotype across multiple types of solid cancers. The regulation of gene transcription by hypoxia-inducible factor (HIF) is a key element in this response. HIF directly upregulates the expression of many hundreds of protein-coding genes, which act to both improve oxygen delivery and to reduce oxygen demand. However, it is now becoming apparent that many classes of noncoding RNAs are also regulated by hypoxia, with several (e.g. micro RNAs, long noncoding RNAs and antisense RNAs) under direct transcriptional regulation by HIF. These hypoxia-regulated, noncoding RNAs may act as effectors of the indirect response to HIF by acting on specific coding transcripts or by affecting generic RNA-processing pathways. In addition, noncoding RNAs may also act as modulators of the HIF pathway, either by integrating other physiological responses or, in the case of HIF-regulated, noncoding RNAs, by providing negative or positive feedback and feedforward loops that affect upstream or downstream components of the HIF cascade. These hypoxia-regulated, noncoding transcripts play important roles in the aggressive hypoxic phenotype observed in cancer. CONTEXT: Renal cancer is a common urologic malignancy, and therapeutic options for metastatic disease are limited. Most clear cell renal cell carcinomas (ccRCC) are associated with loss of von Hippel-Lindau tumor suppressor (pVHL) function and deregulation of hypoxia pathways. OBJECTIVE: This review summarizes recent evidence from genetic and biological studies showing that hypoxia and hypoxia-related pathways play critical roles in the development and progress of renal cancer. EVIDENCE ACQUISITION: We used a systematic search for articles using the keywords hypoxia, HIF, renal cancer, and VHL. EVIDENCE SYNTHESIS: Identification of the tumor suppressor pVHL has allowed the characterization of important ccRCC-associated pathways. pVHL targets α-subunits of hypoxia-inducible transcription factors (HIF) for proteasomal degradation. The two main HIF-α isoforms have opposing effects on RCC biology, possibly through distinct interactions with additional oncogenes. Furthermore, HIF-1α activity is commonly diminished by chromosomal deletion in ccRCCs, and increased HIF-1 activity reduces tumor burden in xenograft tumor models. Conversely, polymorphisms at the HIF-2α gene locus predispose to the development of ccRCCs, and HIF-2α promotes tumor growth. Genetic studies have revealed a prominent role for chromatin-modifying enzyme genes in ccRCC, and these may further modulate specific aspects of the HIF response. This suggests that, rather than global activation of HIF, specific components of the response are important in promoting kidney cancer. Some of these processes are already targets for current therapeutic strategies, and further dissection of this pathway might yield novel methods of treating RCC. CONCLUSIONS: In contrast to many tumor types, HIF-1α and HIF-2α have opposing effects in ccRCC biology, with HIF-1α acting as a tumor suppressor and HIF-2α acting as an oncogene. The overall effect of VHL inactivation will depend on fine-tuning of the HIF response. PATIENT SUMMARY: High levels of hypoxia-inducible transcription factors (HIF) are particularly important in the clear cell type of kidney cancer, in which they are no longer properly regulated by the von Hippel-Lindau protein. The two HIF-α proteins have opposing effects on tumor evolution. BACKGROUND: Clear cell renal cell carcinomas (ccRCC) frequently display a loss of function of the von Hippel-Lindau (VHL) gene. OBJECTIVE: To elucidate the putative relationship between VHL mutation status and immune checkpoint ligand programmed death-ligand 1 (PD-L1) expression. DESIGN, SETTING, AND PARTICIPANTS: A series of 32 renal tumors composed of 11 VHL tumor-associated and 21 sporadic RCCs were used to evaluate PD-L1 expression levels after sequencing of the three exons and exon-intron junctions of the VHL gene. The 786-O, A498, and RCC4 cell lines were used to investigate the mechanisms of PD-L1 regulation. OUTCOME MEASUREMENTS AND STATISTICAL ANALYSIS: Fisher's exact test was used for VHL mutation and Kruskal-Wallis test for PD-L1 expression. If no covariate accounted for the association of VHL and PD-L1, then a Kruskal-Wallis test was used; otherwise Cochran-Mantel-Haenzsel test was used. We also used the Fligner-Policello test to compare two medians when the distributions had different dispersions. RESULTS AND LIMITATIONS: We demonstrated that tumors from ccRCC patients with VHL biallelic inactivation (ie, loss of function) display a significant increase in PD-L1 expression compared with ccRCC tumors carrying one VHL wild-type allele. Using the inducible VHL 786-O-derived cell lines with varying hypoxia-inducible factor-2 alpha (HIF-2α) stabilization levels, we showed that PD-L1 expression levels positively correlate with VHL mutation and HIF-2α expression. Targeting HIF-2α decreased PD-L1, while HIF-2α overexpression increased PD-L1 mRNA and protein levels in ccRCC cells. Interestingly, chromatin immunoprecipitation and luciferase assays revealed a direct binding of HIF-2α to a transcriptionally active hypoxia-response element in the human PD-L1 proximal promoter in 786-O cells. CONCLUSIONS: Our work provides the first evidence that VHL mutations positively correlate with PD-L1 expression in ccRCC and may influence the response to ccRCC anti-PD-L1/PD-1 immunotherapy. PATIENT SUMMARY: We investigated the relationship between von Hippel-Lindau mutations and programmed death-ligand 1 expression. We demonstrated that von Hippel-Lindau mutation status significantly correlated with programmed death-ligand 1 expression in clear cell renal cell carcinomas. Schoerg A, Platt SSJ, Schoedel J, Lindenmeyer MT, Cohen CD, Schroedter K, Mole DR, Wenger RH, Hoogewijs D.	2015. Destruction of a distal hypoxia response element abolishes trans-activation of the PAG1 gene mediated by HIF-independent chromatin looping	AMERICAN JOURNAL OF HEMATOLOGY,	90	(8),	pp. E163-E163. A crucial step in the cellular adaptation to oxygen deficiency is the binding of hypoxia-inducible factors (HIFs) to hypoxia response elements (HREs) of oxygen-regulated genes. Genome-wide HIF-1α/2α/β DNA-binding studies revealed that the majority of HREs reside distant to the promoter regions, but the function of these distal HREs has only been marginally studied in the genomic context. We used chromatin immunoprecipitation (ChIP), gene editing (TALEN) and chromosome conformation capture (3C) to localize and functionally characterize a 82 kb upstream HRE that solely drives oxygen-regulated expression of the newly identified HIF target gene PAG1. PAG1, a transmembrane adaptor protein involved in Src signalling, was hypoxically induced in various cell lines and mouse tissues. ChIP and reporter gene assays demonstrated that the -82 kb HRE regulates PAG1, but not an equally distant gene further upstream, by direct interaction with HIF. Ablation of the consensus HRE motif abolished the hypoxic induction of PAG1 but not general oxygen signalling. 3C assays revealed that the -82 kb HRE physically associates with the PAG1 promoter region, independent of HIF-DNA interaction. These results demonstrate a constitutive interaction between the -82 kb HRE and the PAG1 promoter, suggesting a physiologically important rapid response to hypoxia. BACKGROUND: In mammalians, HIF is a master regulator of hypoxia gene expression through direct binding to DNA, while its role in microRNA expression regulation, critical in the hypoxia response, is not elucidated genome wide. Our aim is to investigate in depth the regulation of microRNA expression by hypoxia in the breast cancer cell line MCF-7, establish the relationship between microRNA expression and HIF binding sites, pri-miRNA transcription and microRNA processing gene expression. METHODS: MCF-7 cells were incubated at 1% Oxygen for 16, 32 and 48 h. SiRNA against HIF-1α and HIF-2α were performed as previously published. MicroRNA and mRNA expression were assessed using microRNA microarrays, small RNA sequencing, gene expression microarrays and Real time PCR. The Kraken pipeline was applied for microRNA-seq analysis along with Bioconductor packages. Microarray data was analysed using Limma (Bioconductor), ChIP-seq data were analysed using Gene Set Enrichment Analysis and multiple testing correction applied in all analyses. RESULTS: Hypoxia time course microRNA sequencing data analysis identified 41 microRNAs significantly up- and 28 down-regulated, including hsa-miR-4521, hsa-miR-145-3p and hsa-miR-222-5p reported in conjunction with hypoxia for the first time. Integration of HIF-1α and HIF-2α ChIP-seq data with expression data showed overall association between binding sites and microRNA up-regulation, with hsa-miR-210-3p and microRNAs of miR-27a/23a/24-2 and miR-30b/30d clusters as predominant examples. Moreover the expression of hsa-miR-27a-3p and hsa-miR-24-3p was found positively associated to a hypoxia gene signature in breast cancer. Gene expression analysis showed no full coordination between pri-miRNA and microRNA expression, pointing towards additional levels of regulation. Several transcripts involved in microRNA processing were found regulated by hypoxia, of which DICER (down-regulated) and AGO4 (up-regulated) were HIF dependent. DICER expression was found inversely correlated to hypoxia in breast cancer. CONCLUSIONS: Integrated analysis of microRNA, mRNA and ChIP-seq data in a model cell line supports the hypothesis that microRNA expression under hypoxia is regulated at transcriptional and post-transcriptional level, with the presence of HIF binding sites at microRNA genomic loci associated with up-regulation. The identification of hypoxia and HIF regulated microRNAs relevant for breast cancer is important for our understanding of disease development and design of therapeutic interventions. Hypoxia-inducible transcription factors (HIFs) mediate the cellular response to hypoxia. HIF-DNA binding triggers a transcriptional program that acts to both restore oxygen homeostasis and adapt cells to low oxygen availability. In this context, HIF is centrally involved in many physiologic and pathophysiological processes such as development, high altitude adaptation, ischemic disease, inflammation, and cancer. The recent development of chromatin immunoprecipitation coupled to genome-wide DNA sequence analysis allows the position and extent of HIF binding to DNA to be characterized across the entire genome and correlated with genetic, epigenetic, and transcriptional analyses. This review summarizes recent pan-genomic analyses of HIF binding and HIF-dependent transcriptional regulation. BACKGROUND: Clear cell renal cancer frequently harbours von Hippel-Lindau (VHL) gene mutations, leading to stabilisation of the hypoxia-inducible factors (HIFs) and expression of their target genes. We investigated HIF-1 and HIF-2 in the regulation of microRNA-210 (miR-210), and its clinical relevance in renal tumours. METHODS: RCC4 and 786-O renal cancer cell lines transfected with either an empty vector or functional VHL and incubated in normoxia or hypoxia were examined for miR-210 expression. Hypoxia-inducible factor siRNAs were used to examine their regulation of miR-210. Seventy-one clear cell renal tumours were sequenced for VHL mutations. Expression of miR-210, VHL, CA9, ISCU and Ki-67 were determined by immunohistochemistry and qRT-PCR. RESULTS: In addition to HIF-1 regulating miR-210 in renal cancer, HIF-2 can regulate this microRNA in the absence of HIF-1. MicroRNA-210 is upregulated in renal cancer compared with normal renal cortex tissue. MicroRNA-210 correlates negatively with its gene target ISCU at the protein and mRNA level. MicroRNA-210 correlated with positive outcome variables and negatively with Ki-67. CONCLUSION: We provide further evidence of miR-210 activity in vivo, and show that high miR-210 expression is associated with better clinico-pathological prognostic factors. Although genome-wide association studies (GWAS) have identified the existence of numerous population-based cancer susceptibility loci, mechanistic insights remain limited, particularly for intergenic polymorphisms. Here, we show that polymorphism at a remote intergenic region on chromosome 11q13.3, recently identified as a susceptibility locus for renal cell carcinoma, modulates the binding and function of hypoxia-inducible factor (HIF) at a previously unrecognized transcriptional enhancer of CCND1 (encoding cyclin D1) that is specific for renal cancers characterized by inactivation of the von Hippelg-Lindau tumor suppressor (pVHL). The protective haplotype impairs binding of HIF-2, resulting in an allelic imbalance in cyclin D1 expression, thus affecting a link between hypoxia pathways and cell cycle control. © 2012 Nature America, Inc. All rights reserved. Enhanced erythropoietic drive and iron deficiency both influence iron homeostasis through the suppression of the iron regulatory hormone hepcidin. Hypoxia also suppresses hepcidin through a mechanism that is unknown. We measured iron indices and plasma hepcidin levels in healthy volunteers during a 7-day sojourn to high altitude (4340 m above sea level), with and without prior intravenous iron loading. Without prior iron loading, a rapid reduction in plasma hepcidin was observed that was almost complete by the second day at altitude. This occurred before any index of iron availability had changed. Prior iron loading delayed the decrease in hepcidin until after the transferrin saturation, but not the ferritin concentration, had normalized. We conclude that hepcidin suppression by the hypoxia of high altitude is not driven by a reduction in iron stores. HIF1A is a transcription factor that plays a central role for the adaptation to tissue hypoxia and for the inflammatory response of myeloid cells, including DCs. HIF1A is stabilized by hypoxia but also by TLR ligands under normoxic conditions. The underlying signaling events leading to the accumulation of HIF1A in the presence of oxygen are still poorly understood. Here, we show that in contrast to hypoxic stabilization of HIF1A, normoxic, TLR-mediated HIF1A accumulation in DCs follows a different pathway that predominantly requires MYD88-dependent NF-κB activity. The TLR-induced HIF1A controls a subset of proinflammatory genes that are insufficiently induced following hypoxia-mediated HIF1A induction. Thus, TLR activation and hypoxia stabilize HIF1A via distinct signaling pathways, resulting in differential HIF1A-dependent gene expression. © Society for Leukocyte Biology. Hypoxia-inducible factor (HIF) regulates the major transcriptional cascade central to the response of all mammalian cells to alterations in oxygen tension. Expression arrays indicate that many hundreds of genes are regulated by this pathway, controlling diverse processes that in turn orchestrate both oxygen delivery and utilization. However, the extent to which HIF exerts direct versus indirect control over gene expression together with the factors dictating the range of HIF-regulated genes remains unclear. Using chromatin immunoprecipitation linked to high throughput sequencing, we identify HIF-binding sites across the genome, independently of gene architecture. Using gene set enrichment analysis, we demonstrate robust associations with the regulation of gene expression by HIF, indicating that these sites operate over long genomic intervals. Analysis of HIF-binding motifs demonstrates sequence preferences outside of the core RCGTG-binding motif but does not reveal any additional absolute sequence requirements. 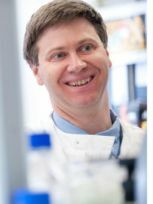 Across the entire genome, only a small proportion of these potential binding sites are bound by HIF, although occupancy of potential sites was enhanced approximately 20-fold at normoxic DNAse1 hypersensitivity sites (irrespective of distance from promoters), suggesting that epigenetic regulation of chromatin may have an important role in defining the response to hypoxia. Human 2-oxoglutarate oxygenases catalyse a range of biological oxidations including the demethylation of histone and nucleic acid substrates and the hydroxylation of proteins and small molecules. Some of these processes are centrally involved in regulation of cellular responses to hypoxia. The ALKBH proteins are a sub-family of 2OG oxygenases that are defined by homology to the Escherichia coli DNA-methylation repair enzyme AlkB. Here we report evidence that ALKBH5 is probably unique amongst the ALKBH genes in being a direct transcriptional target of hypoxia inducible factor-1 (HIF-1) and is induced by hypoxia in a range of cell types. We show that purified recombinant ALKBH5 is a bona fide 2OG oxygenase that catalyses the decarboxylation of 2OG but appears to have different prime substrate requirements from those so far defined for other ALKBH family members. Our findings define a new class of HIF-transcriptional target gene and suggest that ALKBH5 may have a role in the regulation of cellular responses to hypoxia. Hepcidin is a liver-derived hormone with a key role in iron homeostasis. In addition to iron, it is regulated by inflammation and hypoxia, although mechanisms of hypoxic regulation remain unclear. In hepatocytes, hepcidin is induced by bone morphogenetic proteins (BMPs) through a receptor complex requiring hemojuvelin (HJV) as a co-receptor. Type II transmembrane serine proteinase (TMPRSS6) antagonizes hepcidin induction by BMPs by cleaving HJV from the cell membrane. Inactivating mutations in TMPRSS6 lead to elevated hepcidin levels and consequent iron deficiency anemia. Here we demonstrate that TMPRSS6 is up-regulated in hepatic cell lines by hypoxia and by other activators of hypoxia-inducible factor (HIF). We show that TMPRSS6 expression is regulated by both HIF-1α and HIF-2α. This HIF-dependent up-regulation of TMPRSS6 increases membrane HJV shedding and decreases hepcidin promoter responsiveness to BMP signaling in hepatocytes. Our results reveal a potential role for TMPRSS6 in hepcidin regulation by hypoxia and provide a new molecular link between oxygen sensing and iron homeostasis. The ability of iron to accept or donate electrons, coupled with the ability of oxygen to act as an electron acceptor, renders both elements essential to normal cellular biology. However, these same chemical properties allow free iron in solution to generate toxic free radicals, particularly in combination with oxygen. Thus, closely interwoven homeostatic mechanisms have evolved to regulate both iron and oxygen concentrations at the systemic and the cellular levels. Systemically, iron levels are regulated through hepcidin-mediated uptake of iron in the duodenum, whereas intracellular free-iron levels are controlled through iron-regulatory proteins (IRPs). Cardiorespiratory changes increase systemic oxygen delivery, whereas at a cellular level, many responses to altered oxygen levels are coordinated by hypoxia-inducible factor (HIF). However, the mechanisms of iron homeostasis also are regulated by oxygen availability, with alterations in both hepcidin and IRP activity. In addition, many genes involved in iron homeostasis are direct targets of HIF. Furthermore, HIF activation is modulated by intracellular iron, through regulation of hydroxylase activity, which requires iron as a cofactor. In addition, HIF-2alpha translation is controlled by IRP activity, providing another level of interdependence between iron and oxygen homeostasis. Hypoxia has been shown to promote tumor metastasis and lead to therapy resistance. Recent work has demonstrated that hypoxia represses E-cadherin expression, a hallmark of epithelial to mesenchymal transition, which is believed to amplify tumor aggressiveness. The molecular mechanism of E-cadherin repression is unknown, yet lysyl oxidases have been implicated to be involved. Gene expression of lysyl oxidase (LOX) and the related LOX-like 2 (LOXL2) is strongly induced by hypoxia. In addition to the previously demonstrated LOX, we characterize LOXL2 as a direct transcriptional target of HIF-1. We demonstrate that activation of lysyl oxidases is required and sufficient for hypoxic repression of E-cadherin, which mediates cellular transformation and takes effect in cellular invasion assays. Our data support a molecular pathway from hypoxia to cellular transformation. It includes up-regulation of HIF and subsequent transcriptional induction of LOX and LOXL2, which repress E-cadherin and induce epithelial to mesenchymal transition. Lysyl oxidases could be an attractive molecular target for cancers of epithelial origin, in particular because they are partly extracellular. The transcription factor HIF (hypoxia-inducible factor) mediates a highly pleiotrophic response to hypoxia. Many recent studies have focused on defining the extent of this transcriptional response. In the present study we have analysed regulation by hypoxia among transcripts encoding human Fe(II)- and 2-oxoglutarate-dependent oxygenases. Our results show that many of these genes are regulated by hypoxia and define two groups of histone demethylases as new classes of hypoxia-regulated genes. Patterns of induction were consistent across a range of cell lines with JMJD1A (where JMJD is Jumonji-domain containing) and JMJD2B demonstrating robust, and JMJD2C more modest, up-regulation by hypoxia. Functional genetic and chromatin immunoprecipitation studies demonstrated the importance of HIF-1alpha in mediating these responses. Given the importance of histone methylation status in defining patterns of gene expression under different physiological and pathophysiological conditions, these findings predict a role for the HIF system in epigenetic regulation. To avoid localised problems resulting from excess or inadequate oxygen, all cells and tissues have the ability to sense and respond to changes in oxygen levels. Despite their rich blood supply, the kidneys have unique properties with respect to oxygen that enable them to act as specialised organs, sensing oxygen delivery as well as rendering them prone to hypoxic injury. Essential to normal growth and development, as well as the control of energy metabolism, angiogenesis and erythropoiesis, cellular oxygen homoeostasis is central to the pathophysiology of anaemia, ischaemia, inflammation and cancer, both within the kidney and more generally. A major transcriptional pathway, predominantly regulated by hypoxia-inducible factor (HIF), controls many hundreds of genes, either directly or indirectly, that serve to modulate both the supply and consumption of oxygen. Recent advances have illuminated the mechanisms underlying the regulation of HIF by oxygen and have defined novel therapeutic targets. The challenge now is for us to understand the complexities generated by multiple isoforms of the various components of oxygen sensing, the identification of additional levels of control, and the tissue specific responses to activation of the HIF pathway. Mole DR, Ratcliffe PJ. 2008. Erythropoietin: An historical overview of physiology, molecular biology and gene regulation	Textbook of Nephro-Endocrinology,	pp. 1-18. The heterodimeric transcription factor HIF (hypoxia-inducible factor) is central to the regulation of gene expression by oxygen. Three oxygen-dependent prolyl hydroxylase enzymes [PHD1 (prolyl hydroxylase domain 1), PHD2 and PHD3] control the abundance of HIF. In the presence of oxygen, they hydroxylate specific proline residues in HIF-alpha, allowing recognition by pVHL (von Hippel-Lindau protein) and subsequent ubiquitylation and proteasomal destruction. The precise roles and regulation of these enzymes are therefore of particular importance in understanding the physiological and pathological responses to hypoxia. In the present study, we define the existence of two species of PHD1 and provide evidence that they are generated by alternative translational initiation. We demonstrate that these alternative forms are both biologically active with similar HIF prolyl hydroxylase activity but that they differ in their responses to oestrogen, cell confluence and proteasomal inhibition. We show that the two PHD1 species are subject to proteolytic regulation but differ markedly in their protein stability. Though each isoform has the potential to interact with members of the Siah (seven in absentia homologue) ubiquitin ligase family, genetic studies indicated that other proteolytic mechanisms are responsible for control of stability under the conditions examined. The data define the existence of a further level of control in the pathway that regulates cellular responses to hypoxia. Hypoxia-inducible factor (HIF) is a transcription factor with major roles in many cellular and systemic responses to hypoxia. Activation of HIF pathways under hypoxia is mediated by suppression of the Fe(2+)- and O(2)-dependent HIF hydroxylase enzymes that normally inactivate HIFalpha subunits. Mechanisms underlying induction of HIF in normoxic conditions are less clearly understood. In human cancers, infiltrating macrophages show up-regulation of HIF and it has recently been shown that normoxic expression of HIF-1alpha is essential for macrophage function. Here, we report studies of HIF-1alpha induction following phorbol-12-myristate 13-acetate (PMA)-induced differentiation of monocytic U937 and THP1 cells. HIF-1alpha was markedly up-regulated under normoxia in this setting and this involved failure of HIF-1alpha prolyl hydroxylation despite the presence of O(2). Fluorescence measurements showed that differentiation was associated with marked reduction of the labile iron pool. Both the reduction in labile iron pool and the up-regulation of HIF-1alpha were suppressed by RNA interference-mediated down-regulation of the iron transporter natural resistance-associated macrophage protein 1. Up-regulation of HIF-1alpha following PMA-induced differentiation was also abolished by addition of Fe(2+) or ascorbate. These results indicate that physiologic changes in macrophage iron metabolism have an important effect on HIF hydroxylase pathways and suggest means by which the system could be manipulated for therapeutic benefit. Hypoxia inducible factor (HIF) is an alpha/beta heterodimeric transcriptional complex that plays a key role in directing cellular responses to hypoxia. Recent studies have defined novel oxygen-sensitive signal pathways that regulate the activity of HIF by post-translational hydroxylation at specific residues within the alpha subunits. HIF prolyl hydroxylation regulates proteolytic degradation of HIF whereas HIF asparaginyl hydroxylation modulates interaction with transcriptional co-activators. These hydroxylations are catalysed by a set of non-haem Fe(II)- and 2-oxoglutarate (2-OG)-dependent dioxygenases. During catalysis, the splitting of molecular oxygen is coupled to the hydroxylation of HIF and the oxidative decarboxylation of 2-OG to give succinate and CO2. Hydroxylation at two prolyl residues within the central 'degradation domain' of HIF-alpha increases the affinity for the von Hippel-Lindau (pVHL) E3 ligase complex by at least three orders of magnitude, thus directing HIF-alpha polypeptides for proteolytic destruction by the ubiquitin/proteasome pathway. Since the HIF hydroxylases have an absolute requirement for molecular oxygen this process is suppressed in hypoxia allowing the HIF-alpha to escape destruction and activate transcription. Co-substrate and co-factor requirements for Fe(II), ascorbate, and the Krebs cycle intermediate 2-OG, and inducible changes in the cellular abundance of three closely related HIF prolyl hydroxylases (PHD1-3) provide additional interfaces with cellular oxygen status that may be important in regulating the oxygen-sensitive signal. Hypoxia-inducible factor (HIF) is a family of transcription factors that regulate the homeostatic response to oxygen deprivation during development, physiological adaptation, and pathological processes such as ischemia and neoplasia. Our understanding of the function of different HIF isoforms is being advanced by understanding the processes that regulate their activity, learning where and when they are expressed and what genes they regulate. Individuals with hemizygous germline fumarate hydratase (FH) mutations are predisposed to renal cancer. These tumors predominantly exhibit functional inactivation of the remaining wild-type allele, implicating FH inactivation as a tumor-promoting event. Hypoxia-inducible factors are expressed in many cancers and are increased in clear cell renal carcinomas. Under normoxia, the HIFs are labile due to VHL-dependent proteasomal degradation, but stabilization occurs under hypoxia due to inactivation of HIF prolyl hydroxylase (HPH), which prevents HIF hydroxylation and VHL recognition. We demonstrate that FH inhibition, together with elevated intracellular fumarate, coincides with HIF upregulation. Further, we show that fumarate acts as a competitive inhibitor of HPH. These data delineate a novel fumarate-dependent pathway for regulating HPH activity and HIF protein levels. Hypoxia-inducible factor (HIF) is a transcriptional complex that is regulated by oxygen sensitive hydroxylation of its alpha subunits by the prolyl hydroxylases PHD1, 2 and 3. To better understand the role of these enzymes in directing cellular responses to hypoxia, we derived an assay to determine their specific activity in both native cell extracts and recombinant sources of enzyme. We show that all three are capable of high rates of catalysis, in the order PHD2=PHD3>PHD1, using substrate peptides derived from the C-terminal degradation domain of HIF-alpha subunits, and that each demonstrates similar and remarkable sensitivity to oxygen, commensurate with a common role in signaling hypoxia. The vasodilator hydralazine, used clinically in cardiovascular therapy, relaxes arterial smooth muscle by inhibiting accumulation of intracellular free Ca2+ via an unidentified primary target. Collagen prolyl hydroxylase is a known target of hydralazine. We therefore investigated whether inhibition of other members of this enzyme family, namely the hypoxia-inducible factor (HIF)-regulating O2-dependent prolyl hydroxylase domain (PHD) enzymes, could represent a novel mechanism of action. Hydralazine induced rapid and transient expression of HIF-1alpha and downstream targets of HIF (endothelin-1, adrenomedullin, haem oxygenase 1, and vascular endothelial growth factor [VEGF]) in endothelial and smooth muscle cells and induced endothelial cell-specific proliferation. Hydralazine dose-dependently inhibited PHD activity and induced nonhydroxylated HIF-1alpha, evidence for HIF stabilization specifically by inhibition of PHD enzyme activity. In vivo, hydralazine induced HIF-1alpha and VEGF protein in tissue extracts and elevated plasma VEGF levels. In sponge angiogenesis assays, hydralazine increased stromal cell infiltration and blood vessel density versus control animals. Thus, hydralazine activates the HIF pathway through inhibition of PHD activity and initiates a pro-angiogenic phenotype. This represents a novel mechanism of action for hydralazine and presents HIF as a potential target for treatment of ischemic disease. Hydroxylation of hypoxia-inducible factor, a nuclear transcription factor, is catalysed by iron and 2-oxoglutarate dependent hydroxylases. Various analogues of the 2-oxoglutarate cosubstrate were synthesised and shown to inhibit the activity of human hypoxia-inducible factor-1alpha prolyl hydroxylases in cell-free extracts. Analogues of the naturally occurring cyclic hydroxamate dealanylalahopcin, which is an inhibitor of procollagen prolyl-4-hydroxylase, were synthesised and shown to be inhibitors of the human hypoxia-inducible factor prolyl hydroxylases. Chuvash polycythemia is an autosomal recessive disorder that is endemic to the mid-Volga River region. We previously mapped the locus associated with Chuvash polycythemia to chromosome 3p25. The gene associated with von Hippel-Lindau syndrome, VHL, maps to this region, and homozygosity with respect to a C-->T missense mutation in VHL, causing an arginine-to-tryptophan change at amino-acid residue 200 (Arg200Trp), was identified in all individuals affected with Chuvash polycythemia. The protein VHL modulates the ubiquitination and subsequent destruction of hypoxia-inducible factor 1, subunit alpha (HIF1alpha). Our data indicate that the Arg200Trp substitution impairs the interaction of VHL with HIF1alpha, reducing the rate of degradation of HIF1alpha and resulting in increased expression of downstream target genes including EPO (encoding erythropoietin), SLC2A1 (also known as GLUT1, encoding solute carrier family 2 (facilitated glucose transporter), member 1), TF (encoding transferrin), TFRC (encoding transferrin receptor (p90, CD71)) and VEGF (encoding vascular endothelial growth factor). HIF is a transcriptional complex that plays a central role in mammalian oxygen homeostasis. Recent studies have defined posttranslational modification by prolyl hydroxylation as a key regulatory event that targets HIF-alpha subunits for proteasomal destruction via the von Hippel-Lindau ubiquitylation complex. Here, we define a conserved HIF-VHL-prolyl hydroxylase pathway in C. elegans, and use a genetic approach to identify EGL-9 as a dioxygenase that regulates HIF by prolyl hydroxylation. In mammalian cells, we show that the HIF-prolyl hydroxylases are represented by a series of isoforms bearing a conserved 2-histidine-1-carboxylate iron coordination motif at the catalytic site. Direct modulation of recombinant enzyme activity by graded hypoxia, iron chelation, and cobaltous ions mirrors the characteristics of HIF induction in vivo, fulfilling requirements for these enzymes being oxygen sensors that regulate HIF. Hypoxia-inducible factor (HIF) is central in coordinating many of the transcriptional adaptations to hypoxia. Composed of a heterodimer of alpha and beta subunits, the alpha subunit is rapidly degraded in normoxia, leading to inactivation of the hypoxic response. Many models for a molecular oxygen sensor regulating this system have been proposed, but an important finding has been the ability to mimic hypoxia by chelation or substitution of iron. A key insight has been the recognition that HIF-alpha is targeted for degradation by the ubiquitin-proteasome pathway through binding to the von Hippel-Lindau tumour suppressor protein (pVHL), which forms the recognition component of an E3 ubiquitin ligase complex leading to ubiquitylation of HIF-alpha. Importantly, the classical features of regulation by iron and oxygen availability are reflected in regulation of the HIF-alpha/pVHL interaction. It has recently been shown that HIF-alpha undergoes an iron- and oxygen-dependent modification before it can interact with pVHL, and that this results in hydroxylation of at least one prolyl residue (HIF-1alpha, Pro 564). This modification is catalysed by an enzyme termed HIF-prolyl hydroxylase (HIF-PH), and compatible with all previously described prolyl-4-hydroxylases HIF-PH also requires 2-oxoglutarate as a cosubstrate. The key position of this hydroxylation in the degradation pathway of HIF-alpha, together with its requirement for molecular dioxygen as a co-substrate, provides the potential for HIF-PH to function directly as a cellular oxygen sensor. However, the ability of these enzyme(s) to account for the full range of physiological regulation displayed by the HIF system remains to be defined. The von Hippel-Lindau tumour suppressor gene product (pVHL) associates with the elongin B and C and Cul2 proteins to form a ubiquitin-ligase complex (VCBC). To date, the only VCBC substrates identified are the hypoxia-inducible factor alpha subunits (HIF-1alpha and HIF-2alpha). However, pVHL is thought to have multiple functions and the significance of HIF-1alpha and HIF-2alpha regulation for tumour suppressor activity has not been defined. VHL disease is characterized by distinct clinical subtypes. Thus haemangioblastomas (HABs) and renal cell carcinoma (RCC) but not phaeochromocytoma (PHE) occur in type 1 VHL disease. Type 2 subtypes are characterized by PHE susceptibility but differ with respect to additional tumours (type 2A, PHE+HAB but not RCC; type 2B, PHE+ HAB+RCC; type 2C, PHE only). We investigated in detail the effect of 13 naturally occurring VHL mutations (11 missense), representing each phenotypic subclass, on HIF-alpha subunit regulation. Consistent effects on pVHL function were observed for all mutations within each subclass. Mutations associated with the PHE-only phenotype (type 2C) promoted HIF-alpha ubiquitylation in vitro and demonstrated wild-type binding patterns with pVHL interacting proteins, suggesting that loss of other pVHL functions are necessary for PHE susceptibility. Mutations causing HAB susceptibility (types 1, 2A and 2B) demonstrated variable effects on HIF-alpha subunit and elongin binding, but all resulted in defective HIF-alpha regulation and loss of p220 (fibronectin) binding. All RCC-associated mutations caused complete HIF-alpha dysregulation and loss of p220 (fibronectin) binding. Our findings are consistent with impaired ability to degrade HIF-alpha subunit being required for HAB development and RCC susceptibility. Hypoxia-inducible factor (HIF) is a transcriptional complex that plays a central role in the regulation of gene expression by oxygen. In oxygenated and iron replete cells, HIF-alpha subunits are rapidly destroyed by a mechanism that involves ubiquitylation by the von Hippel-Lindau tumor suppressor (pVHL) E3 ligase complex. This process is suppressed by hypoxia and iron chelation, allowing transcriptional activation. Here we show that the interaction between human pVHL and a specific domain of the HIF-1alpha subunit is regulated through hydroxylation of a proline residue (HIF-1alpha P564) by an enzyme we have termed HIF-alpha prolyl-hydroxylase (HIF-PH). An absolute requirement for dioxygen as a cosubstrate and iron as cofactor suggests that HIF-PH functions directly as a cellular oxygen sensor. Jejuno-ileal bypass has until recently been an accepted treatment for refractory morbid obesity. Although hyperoxaluria causing renal tract calculi is a well-recognized complication, we describe eight patients who developed significant renal failure attributable to hyperoxaluria resulting from this procedure, three requiring renal replacement therapy. We review the literature, describing 18 other cases with renal failure, the mechanisms of hyperoxaluria and its treatment. Because reversal of the bypass may result in stabilization or partial improvement of renal function, these patients require long-term follow-up of renal function. The von Hippel-Lindau tumor suppressor protein (pVHL) has emerged as a key factor in cellular responses to oxygen availability, being required for the oxygen-dependent proteolysis of alpha subunits of hypoxia inducible factor-1 (HIF). Mutations in VHL cause a hereditary cancer syndrome associated with dysregulated angiogenesis, and up-regulation of hypoxia inducible genes. Here we investigate the mechanisms underlying these processes and show that extracts from VHL-deficient renal carcinoma cells have a defect in HIF-alpha ubiquitylation activity which is complemented by exogenous pVHL. This defect was specific for HIF-alpha among a range of substrates tested. Furthermore, HIF-alpha subunits were the only pVHL-associated proteasomal substrates identified by comparison of metabolically labeled anti-pVHL immunoprecipitates from proteosomally inhibited cells and normal cells. Analysis of pVHL/HIF-alpha interactions defined short sequences of conserved residues within the internal transactivation domains of HIF-alpha molecules sufficient for recognition by pVHL. In contrast, while full-length pVHL and the p19 variant interact with HIF-alpha, the association was abrogated by further N-terminal and C-terminal truncations. The interaction was also disrupted by tumor-associated mutations in the beta-domain of pVHL and loss of interaction was associated with defective HIF-alpha ubiquitylation and regulation, defining a mechanism by which these mutations generate a constitutively hypoxic pattern of gene expression promoting angiogenesis. The findings indicate that pVHL regulates HIF-alpha proteolysis by acting as the recognition component of a ubiquitin ligase complex, and support a model in which its beta domain interacts with short recognition sequences in HIF-alpha subunits. The concept of an alkaline tide which compensates for gastric acid secretion suggests the possibility of indirect measurement of gastric acid secretion. This study was designed to determine whether postprandial changes in renal and respiratory function could be used to assess gastric secretion in healthy adults. Volunteers ate one of three standard (low, medium or high protein) breakfasts on separate days. A fall in urine acid output was observed during 2 h after the high protein meal, but not after the medium or low protein meal. Fasting subjects showed a similar fall in urine acid output over a 2-hour period. Pretreatment with ranitidine 150 mg b.i.d. had no effect on basal or postprandial urine acid output. We conclude that changes in urine acid output are not related to the gastric secretory response to food. In a separate study, treatment with omeprazole 20 mg daily had no effect on postprandial respiratory function (minute ventilation; mixed expired CO2; minute volume of CO2; respiratory exchange ratio; venous blood pH, pCO2 or bicarbonate; and end tidal CO2). Thus we were unable to detect a respiratory alkaline tide after a standard breakfast. These findings suggest that any respiratory or urinary compensation for gastric acid secretion is too small to be of physiological or clinical significance. MOLE DR, JOHNSON CD. 1992. ABSENCE OF THE POSTPRANDIAL URINARY ALKALINE TIDE UNDER CONTROLLED CONDITIONS IN MAN	JOURNAL OF PHYSIOLOGY-LONDON,	446	pp. P583-P583. A study was made of the deposition of 99Tcm-DTPA aerosol in the components of a jet nebulizer-based aerosol production system. Three impaction devices were compared: a ball-bearing separator, a virtual impactor and a step separator. In addition a comparison was made of two types of tubing which carried aerosol from nebulizer to mouthpiece: corrugated and smooth-walled tubing. The retention of aerosol following inhalation was measured in five normal volunteers using different patterns of breathing. Using an aerosol production system which included a ball-bearing separator only a mean of 11% of the radioactivity loaded into the nebulizer was emitted as an aerosol. Some 18% remained in the ball-bearing separator. The ball-bearing and step separators produced similar total outputs (7% and 6% minimum), the step separator producing marginally higher mean output/min. The virtual impactor produced a lower output than the other two impactors studied, only 1%. A larger proportion of the aerosol output was deposited on corrugated tubing (7%) compared with smooth-walled tubing (1%). The retained fraction of the aerosol inhaled by subjects ranged from 16% to 43%. A higher fraction was retained when subjects inhaled deeply and held their breath for 10 s between each breath. The efficiency of radionuclide deposition from aerosol generator to patient ranged from 1.1% to 6% and was determined more by the retention in the subject than by choice of separator or tubing. WOOLMAN PS, MOLE DR, DENDY PP, HIGENBOTTAM TW. 1986. DEPOSITED FRACTION OF AQUEOUS AEROSOLS IN THE HUMAN-LUNG	CLINICAL SCIENCE,	71	pp. P8-P8.